World Book Day - the perfect excuse for crafty and organised mums to show the rest of us up with their wonderful hand-made children's costumes. And a wonderful way for shops to cash in on fancy dress outfits. I'm not particularly crafty and when I suggested making an outfit for my eldest, he quickly changed his mind about what he would wear and suggested I buy him a onesie. So we went with option two - spend our money in the shops. Check your dressing up box and suggest possible characters before giving your children free-reign on deciding what they will dress up as. As soon as you find out the date and the theme, agree on a character and start trawling eBay or Amazon for outfits. Talk to other parents and suggest swapping outfits (the outfit your child wore last year might be perfect for their child this year - and vice versa). I failed massively on numbers one and two and only thought about number three when it was too late to do anything about it. I also faced an additional challenge this year. Not content with just asking parents to send their children to school as a book character, this year, my kids' school added an additional theme: animals. And instead of checking our overflowing dressing up box to see what we already had, I made the schoolgirl error of asking my older two what they would like to dress up as. (Un)luckily, they had pretty clear ideas. Initially, the 7 year old wanted to dress as a crocodile from Roald Dahls' 'The Enormous Crocodile', but when I mentioned making a head-dress out of cardboard and paint, he quickly changed his mind to the monkey from Roald Dahl's 'The Giraffe and the Pelly and Me'. The 4 year old wanted to be a tiger, so I suggested one of her favourite books, Judith Kerr's 'The Tiger Who Came To Tea'. This should be simple, I thought. We already have masks. I just need to track down two onesies in the style of a monkey and a tiger. And if I can't find anything, I'm sure I can cobble together some brown trousers and a brown top and some orange clothes that can be adjusted with some black permanent marker pen. Ha, ha, ha, ha! My two were set on a onesie and they were unimpressed at my Plan B. And, it seemed that every other parent had a similar idea. The result was that I spent all day yesterday (last minute queen that I am) traipsing around various outlets: Matalan (Disney heavy), Home Bargains (a cat and a dog), Lidl, Tesco - nada. I then spoke to a friend who mentioned she'd seen a tiger onesie in Asda. So off we trekked. There were two left. One in 9-10 and one in 3-4. Bingo! - OK so it's a tiny bit on the small side but I have younger siblings who will make good use of it. Tiger for the 4 year old sorted, monkey to go. 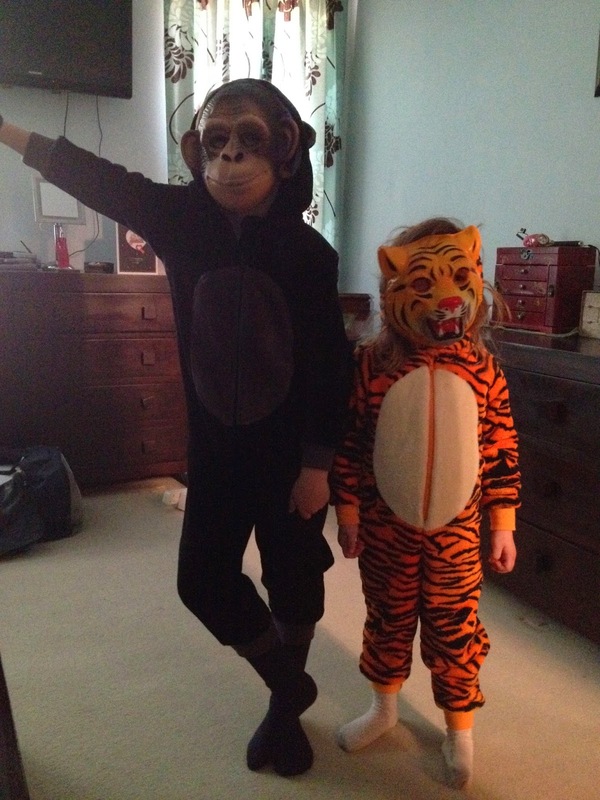 Surely, it couldn't be to difficult to find a monkey onesie suitable for a 7 year old. We tried Sainsbury's. No luck. By now, it was time to collect them from school, so I decided to try my local fancy dress and toy shop, Jackman's. There were two monkey outfits: toddler size and adult size. I began to prepare my eldest for the home-made back-up plan, but we decided to try the only two other shops in our town that sell children's size clothes: Peacocks (which had a wolf outfit) and then M&Co. And there is was. A size 5-6 monkey onesie. It's pretty short on the legs, but other than that it was perfect. And it will be well-used when the younger ones grow into it. It might be time to start preparing our outfits for Hallowe-en - unless there are any other dress-up days before then? What outfits did your children wear for #worldbookday? And how did you manage to sort out their costumes?